Our own Marsha and Jenny were honored to serve as celebrity judges for the Texas Wedding Guide’s 2nd Annual Platinum Cake Competition this past Tuesday night! 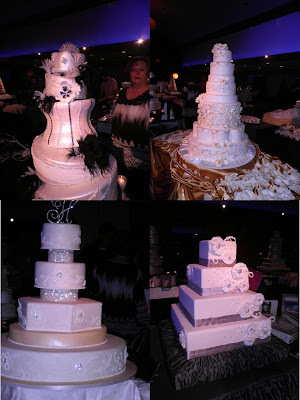 Held in the Pegasus Ballroom of the Magnolia Hotel, the contest was between several of the area’s top wedding bakeries who competed for the top honors of Best in Show and Best Taste. 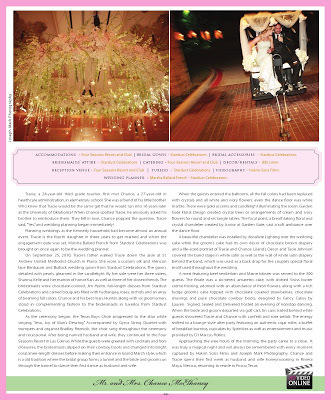 Guests at the event included brides-to-be and their grooms and many illustrious wedding professionals. Attendees started the night by enjoying cocktails and hors d’oeuvres and were then treated to a compilation video featuring the bakeries. Then each baker was announced and headed to their competition table. Partygoers meandered throughout the room, tasting the luscious wedding cake samples and voting on Best in Show, while the Celebrity Panel of Judges, seated at the front of the ballroom, enjoyed bites from all nine fabulous cakes to crown the winner of the Best Taste award. Joining Marsha and Jenny on the celebrity panel of judges were Chef Paul Zofsak of the Magnolia Hotel, Bronwen Weber of Frosted Art , Chef Arturo Romanillos of Le Cordon Bleu College of Culinary Arts, TWG Bride Susan (George) Jackson, winner of the Texas Wedding Guide Dream Team Wedding Giveaway, and another Bride selected from the audience. The bakery contestants included: Opulent Cakes, Sugar Bee Sweets, Crème de la Crème, Sweet Memories Cakes & Catering, Elegant Cakery, Romano’s Bakery, The Cake Guys, Elena’s Cakes and The Classic Gourmet. Below are a few pics we snapped with our own little camera. You can be sure that we will post the professional photos when we get them! 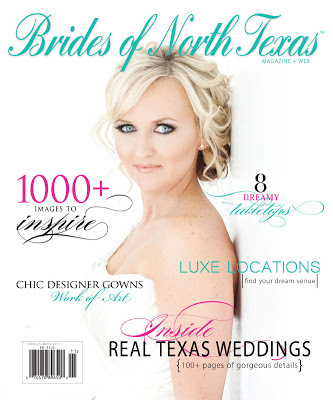 And of course, the wonderful Texas Wedding Guide, for putting on such a fantastic and fun event. Thank you for including us! It was a privilege to serve on the panel, and we had a great time! Thank you Brides of North Texas for featuring one of our gorgeous weddings in your Spring/Summer 2011 issue! Last fall we posted details about the beautiful wedding celebration of Tracie and Chance, sharing some stunning photos and a super-sweet video highlight of their amazing reception. 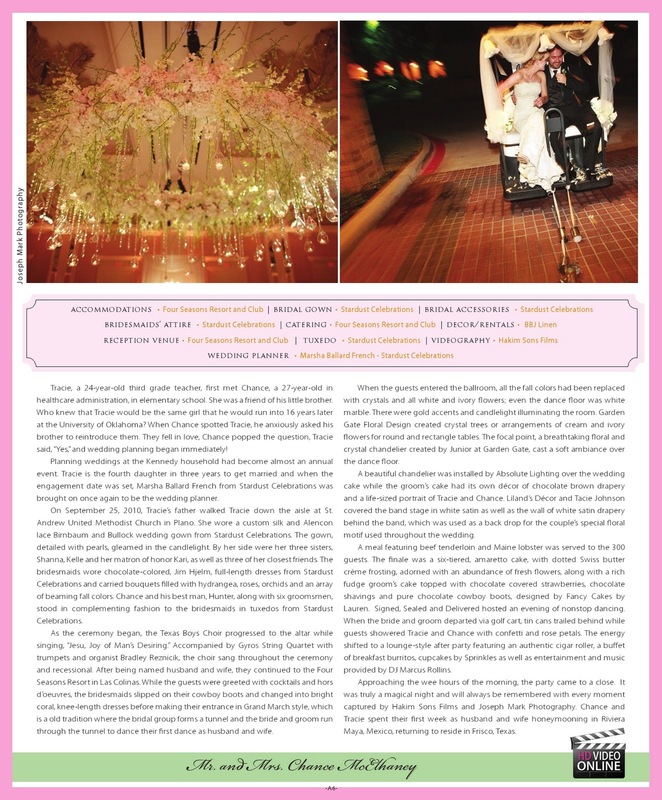 This lovely wedding is now gracing the pages of the current issue of the fabulous BONT. Check it out! 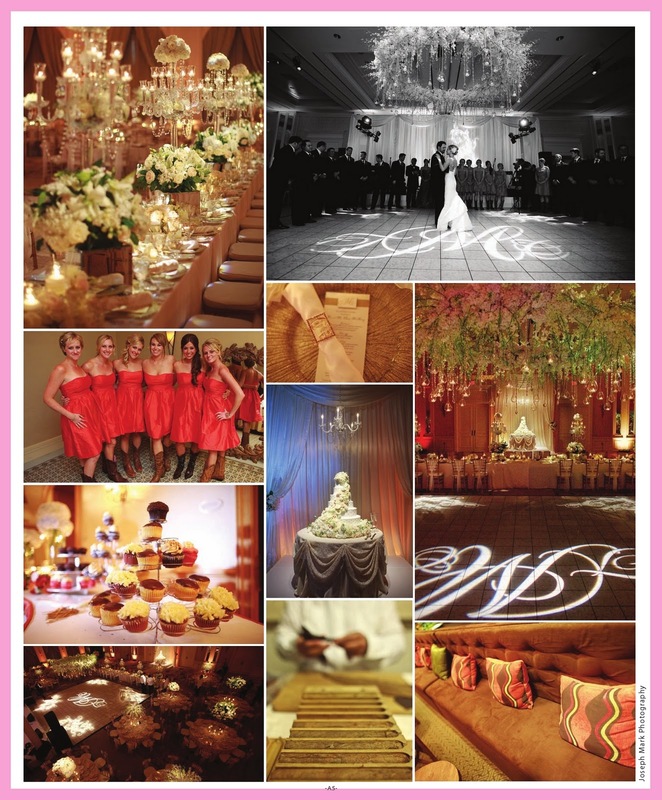 We are so excited to again be a major sponsor of one of the most fabulous bridal shows around! 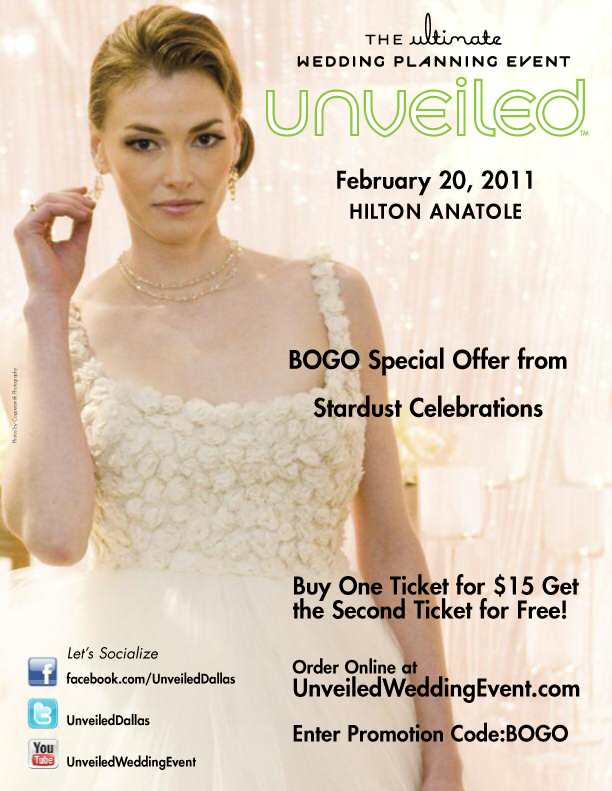 This Sunday brings us Unveiled, Ultimate Wedding Planning Event to the wonderful Hilton Anatole. Presented by The Wedding Guys, Unveiled is a bridal show unlike any other, highlighting the hottest wedding trends, stunning design and décor, the latest wedding party attire and the most talented wedding professionals! Can you say tons of bridal eye candy?! You just will not want to miss this show! And be sure to visit our StarDust Celebrations showcase for your opportunity to receive our exclusive Unveiled special! 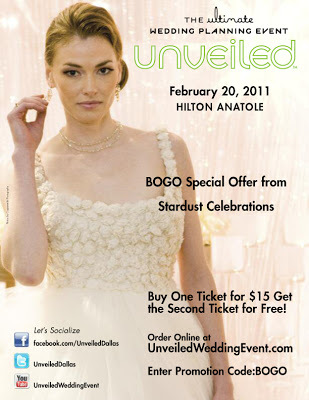 StarDust Bridal Salon is honored to be putting on the wedding gown fashion show during Unveiled, featuring 20 amazing bridal gowns from seven of our phenomenal designers. Bruce Vassar of The Wedding Guys will be on Fox 4 Good Day this Friday to give a sneak peek of the show and two of our gorgeous gowns! This year, we are pleased to present you with a special admission offer – buy one ticket, get one free! Use this special promotion code when purchasing your ticket. February 20, 11:00 a.m. – 4:00 p.m. 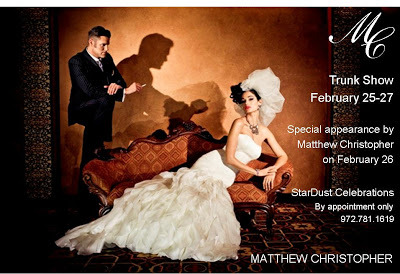 Fashion Shows at 1:00 and 3:00 p.m.
We are thrilled to announce that for the fourth consecutive year, StarDust Bridal Salon has been voted Favorite Bridal Salon by the members of the American Association of Certified Wedding Planners (AACWP). 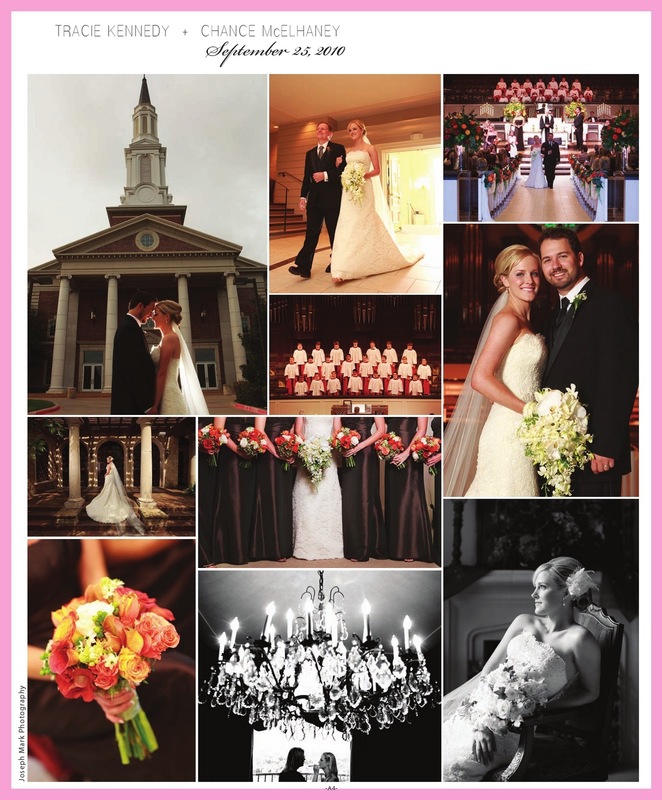 The talented wedding planners that are members of this organization voted on their favorite vendors in 17 categories. 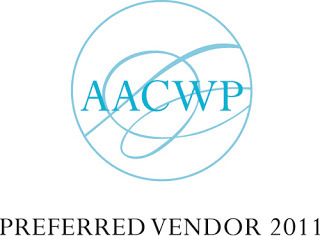 Thank you, AACWP planners for believing in us and entrusting your clients to us. 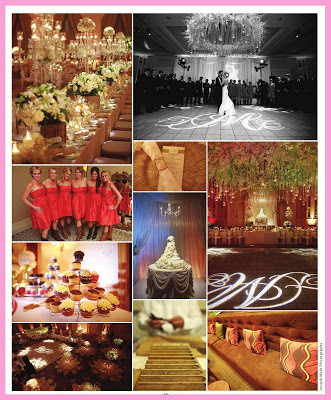 We are honored to be selected by such an elite group of wedding professionals. And please, keep bringing us your beloved brides!